K2, also known as Chhogori/Qogir and Mount Godwin-Austen(Native Balti is called Chhoghori) (Balti/Tibetan script) is the second highest mountain in the world at 8,611 meters (28,251 ft), after Mount Everest. It is located on the border between Baltistan, in the Gilgit–Baltistan region of northern Pakistan, and the Taxkorgan Tajik Autonomous County of Xinjiang, China. With a peak elevation of 8,611 m (28,251 feet), K2 is the highest point of the Karakoram Range and the highest point in Pakistan. 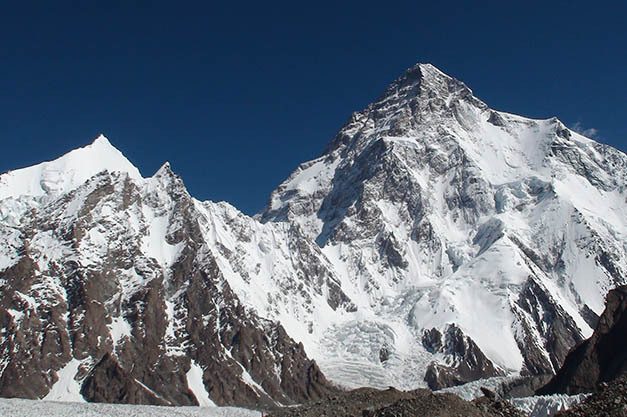 K2 is known as the Savage Mountain due to the extreme difficulty of ascent and the second-highest fatality rate among the eight thousanders. It is more difficult and hazardous to reach the peak of K2 from the Chinese side; thus, it is usually climbed from the Pakistani side. K2 has never been climbed during wintertime. 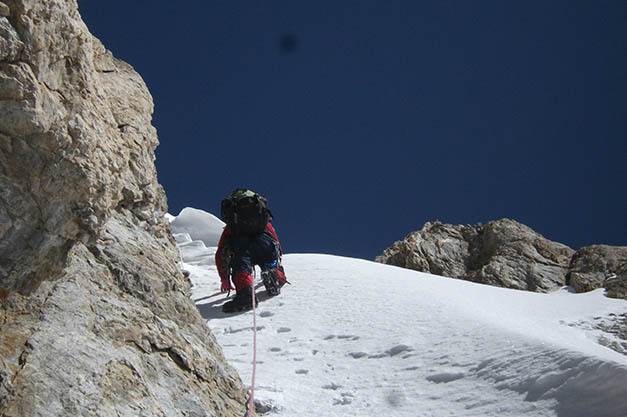 K-2 Expedition will be lead by professional climbers Mr Karim Hayat and Naseer. D. 13-51, 38 days for acclimatization and climb the peak. Trek back to Askole or Hushe, Proceed to Skardu. Drive to Islamabad and fly to home destination. Pax 5-7 U$D. 5600. Pax 8-10 U$D. 5300. One high altitude porter. 5600. 2. Hotel accommodation (twin sharing rooms) with full meals, mineral water during the hotel meals. All meals during the trek. 3. Sleeping tents (two men) Mess and kitchen tents, Shower and store tents, sleeping Mattresses, tables and chairs, toilet tent. 4. Kitchen appliances, including stove, fuel and crockery etc. International and airport taxes. Excess weight. Insurance liability and other under force majors conditions, first aid kit, personal insurance and helicopter rescue coverage etc. Helicopter rescue fee U$.10000- this amount is refund able, if rescue operation des not take place. In case of changes in the program we will charge the group according to the actual coast.